Earlier this week, Johns Hopkins University undergraduate and graduate students voicing ongoing opposition to the university’s all-but-fully-approved campus police force and demanding an end to JHU’s contracts with Immigrations and Customs Enforcement (ICE), walked into administrative building Garland Hall and kicked off a sit-in. Wearing shirts with “NO ICE” and “NO PRIVATE POLICE” on them, the 30 or so hung up a large banner which read “NO PRIVATE POLICE, NO ICE CONTRACTS, JUSTICE FOR TYRONE WEST,” chanted “Ronny D loves the BPD”—a reference to JHU president Ronald Daniels—and then Peter Weck, a member of the Hopkins Coalition Against ICE announced that this was indeed, a sit-in. “We’re not going to be sitting in a circle, we’ll be sitting in clumps,” Mira Wattal, of Students Against Private Police (SAPP) announced and the group quickly fanned out and sat on the floor, up against the walls, and at the few tables and couches in Garland Hall, filling the lobby of the building where President Daniels has his office with energized students ready to wait the university out. “This time around we’re actually going to be sitting in here so that they will have no choice but to continue to listen and talk with us until our demands are met,” Weck said. The sit-in was the surprise start of April 3, a day full of highly-organized, multi-faceted actions by JHU students and Baltimore activists making a strong argument that Hopkins students and the surrounding neighborhoods oppose police and related militarization that also showed that they can police themselves just fine—and build community along the way. For more than a year now, the JHU administration has pushed for its own police force (for a complicated history of this endeavor, read The Beat’s “The Winding and Contested Path to a Johns Hopkins Police Force”), crowbarring the plan into last year’s legislation with little warning at the end of session and this year, rewriting the bill and backing it up with a serious P.R. campaign and a series of weighted panels and community discussions. It has been met with strong student and significant community opposition. A Student Government Association referendum showed that 74.5% of the undergraduate student body opposed the police force, though JHU spokespersons have countered this by arguing “only 35 percent of Homewood undergraduates voted in that poll.” JHU has offered no poll of their own (most polls only involve a percentage of a given population anyway, that’s sort of the whole point of a poll). And as Baltimore Brew reported, ten current or former Hopkins officials including Daniels gave Mayor Catherine Pugh a combined $16,000 in one day, a month before the private police measure was announced. On April 1, the Maryland Legislature passed the final bill allowing JHU to create the police force. All that needs to be done at this point is for Governor Larry Hogan to sign the bill, which seems imminent. Though now a group, Women Against Private Police, is pushing for a ballot referendum on the issue (they would need more than 69,000 signatures), options for stopping the police force are at this point, pretty limited. “With Students Against Private Police no longer having much of say in where this is in the legislative process—this is the next step,” student and Vice President of Advocates for Disability Awareness Sabrina Epstein said. As details on the planned police force trickled out in 2018 and ICE under President Trump grew even more vicious, JHU professor Drew Daniel (also of the electronic group Matmos) called attention to the fact that JHU had a contract with ICE to provide medical and leadership training. 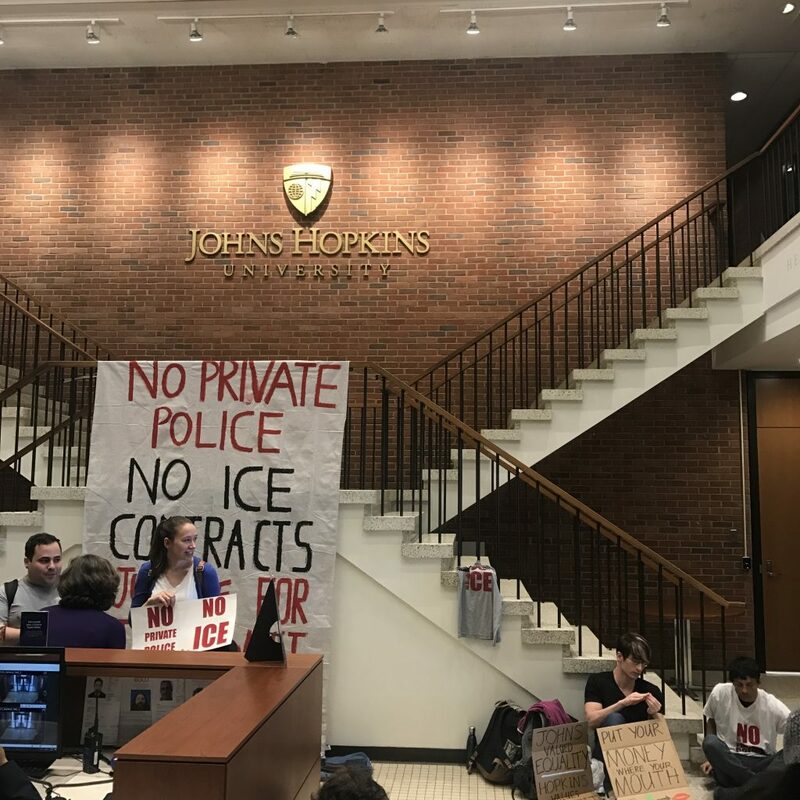 In September of last year, students protesting JHU’s ICE involvement marched into Garland Hall and unfurled a petition with nearly 2,000 signatures demanding Hopkins drop its ICE contract. The university has stressed that they will continue the contracts and also strongly oppose the Trump administration’s immigration policies. Daniel (“I can’t ignore this institution as it wanders ever farther into a moral abyss,” he said at an April anti-ICE protest) and others argue it is incompatible to have contracts with ICE and also oppose ICE policies. Graduate student Marios Falaris who was part of the sit-in said that JHU working with ICE violates the lessons JHU imparts to its students when they arrive. 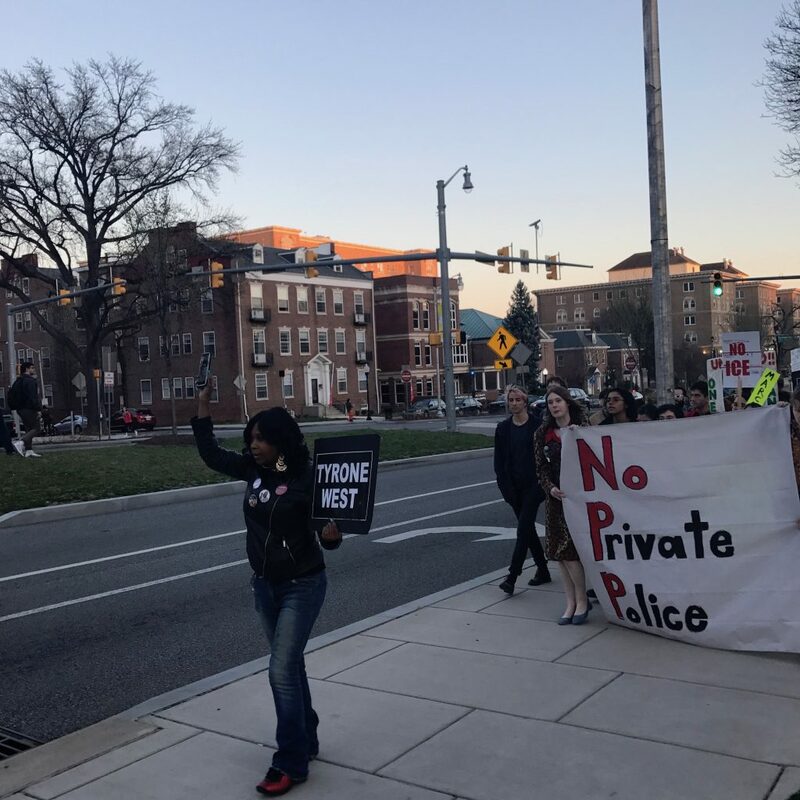 Police and university officials were only anticipating serious organizing later in the day on Wednesday—a Stop The Militarization Of Hopkins rally and march had been announced for the evening. The sit-in was kept secret before it happened and is the most overt example of these related anti-private police and anti-ICE causes working closely together rather than simply sharing common concerns and showing up for one another. Every hour on the hour, the group gathered, got silent for a moment, celebrated another hour of sitting-in, and an organizer led the group in a few chants. Then they all sang songs of struggle and solidarity—acapella versions of “We Shall Overcome,” “We Shall Not Be Moved,” “This Little Light Of Mine,” as well as the Impressions’ “Keep On Pushing” blasting from a portable speaker and echoing through the hall. This is the other side of organizing. The side that does not only say “no” when it feels it must, but the side that offers solutions, shows another way, and builds together. Later in the day, the sit-in even offered an education component when Rachel Lewis, Associate Professor in Women and Gender Studies,at George Mason University gave her presentation, “Queering Deportability: The Politics of Lesbian Migrant Anti-Deportation Activism” by megaphone to the sit-in. Lewis’ lecture was scheduled for another location on campus but she brought it to the group instead—many of whom would likely have attended if they were not sitting-in. While Lewis spoke inside about the literally deadly effects of harsh immigration enforcement, President Daniels spoke privately with Wattal and Weck outside, telling them why JHU would continue to work with ICE. “We’ve been heard but we haven’t been listened to,” Wattal told Daniels, Weck standing nearby. Daniels added that they could provide input into the Memorandum Of Understanding and other specific details related to the creation of the police force. He also acknowledged how the bill had changed since it was first introduced. “Yeah,” Wattal said, trying to jump in. “So if I could jump in,” Wattal said. When Wattal and Weck returned from their chat with Daniels, they updated the sit-in. “The update is that there is no update,” Wattal told the group, adding that SAPP is “tired” of hearing the same talking points which is all they heard from Daniels. An hour later a core group maintained the sit-in while in Wyman Park Dell, the Stop The Militarization Of Hopkins rally began. It was a collaboration with West Wednesday, the weekly police brutality protest fronted by Tawanda Jones, the sister of Tyrone West, a Baltimore man that in 2013 died in police custody after he was stopped, tased, and beaten by more than a dozen Baltimore City Police Department cops and Morgan State University police. Her brother was an example of what happens when universities have their own police force, she explained (JHU would be the first private university to have its own police force in Maryland, many of the public universities such as Morgan or University of Baltimore already have their own). Around 6:30 p.m., those sitting-in were locked inside the building until it reopened at 7 a.m.. They watched the rally via livestream, witnessing a series of speakers weaving together criticisms of Hopkins—currently standing on the wrong side on three of the most pressing issues of our time: policing, immigration, and labor—constructing an argument that police powers should not be in JHU’s hands given its fraught history including: the exploitation of Henrietta Lacks, the school’s decades of often callous redevelopment and gentrification, its work with the Department of Defense, and current labor disputes with the nurse’s union (National Nurses United filed a complaint with the National Labor Relations Board against Hopkins for union-busting). “One of my friends who is a black man—who is a senior, getting ready to graduate—actually said that he carries his Hopkins ID on his person as if they were his freedom papers,” Chisom of the Black Student Union said. Chris Bilal of the Washington Hill community association in East Baltimore, who had testified against the police bill in Annapolis helped transition the group into marching. The conglomeration of frustration with JHU was intense, as if it might explode, and so the focused and regulated march, with multiple point persons and a clear route, moved along the sidewalk rather than in the road, headed towards President Daniels’ private residence on campus. Jones with a sign that said “No Allegiance To A Deadly Force” in her hand led the group back through JHU—on a day where many admitted students just happened to be visiting. “Show them what Democracy looks like,” Bilal said. “This is what Democracy looks like,” the group responded. “Show them what love looks like,” Bilal said. “This is what love looks like,” the group shouted back. President Daniels’ wide, 61 year-old Georgian house on campus had a few lights on inside, and a few security guards with their arms crossed—and all black, the students pointed out—at the door, and now, nearly 300 Baltimoreans chanting “Ronny D loves BPD” in the front yard. Back in March 2018 closer to 100 people, almost entirely students, marched to Daniels’ house in the middle of the day, using the same chant, and encountered a freaked out security official fruitlessly trying to hold them back. “We want no private police categorically,” Wattal said back then. “An increase of police does not increase safety.” The position is the same though what has changed is the standards and scope of organizing against the police bill. Back at Garland Hall, National Nurses United and Food Not Bombs provided food for the group inside for the night. Remaining inside the building was an agreement the group made with the university based on the demand that the Baltimore Police Department would not remove them and an agreement with JHU that they would not allow more people to join the sit-in. 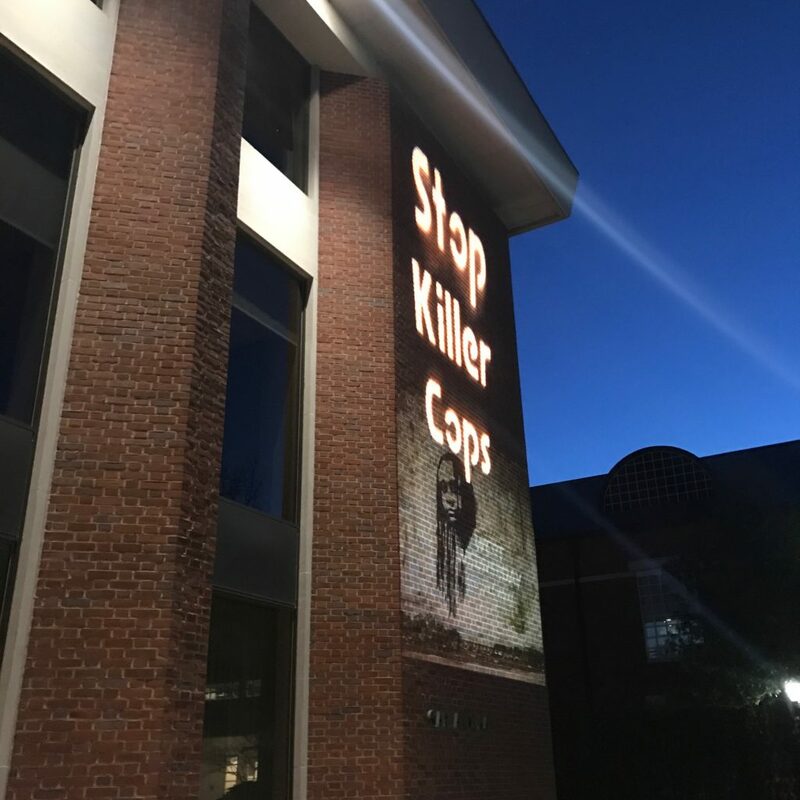 The march ended at Garland Hall, where a projector launched the words “Demilitarize The Police” and “Stop Killer Cops” and photos of Tyrone West and other victims of police brutality onto the side of the building. Garland Hall’s entrance was blocked by a few security guards, Shollenberger standing with them, as protesters passed a megaphone and added more critiques of the university. Bilal made referenced to two delegates who supported the police force bill—Delegate Curt Anderson, stripped of his leadership role and ordered to undergo sexual harassment training, and Cory McCray, who condescended to Senators Jill Carter and Mary Washington, both opponents of the police bill, and as the Beat reported last year, was alleged to have thrown a chair at someone. But Bilal’s words and the roar of protest couldn’t be heard by the sit-in—Garland Hall is essentially soundproofed. In response to the large group outside which they couldn’t hear and only feel, Wattal started a chant with those sitting-in. Behind Wattal, making sure no one from the sit-in got too close to the glass doors, a JHU security guard stood with hands in his pockets and sheepishly shuffled his feet. The sit-in is now on day three. Additional reporting by Jaisal Noor and Taylor Hebden.